It can be challenging to find your next great read, but the Whatcom County Library System (WCLS) has stacked the deck in your favor. To celebrate our 75th anniversary and our love of sharing stories, we’ve created a full deck of reading recommendations, one for each week of 2019. These recommendations are selected from many genres, both adult and youth, and categorized by suit: clubs for belonging, diamonds for strength, hearts for love, and spades for growth. Staff made suggestions from their own favorites for each themed title included in the deck, so all are tried-and -true great reads. Set in Texas during the Mexican Revolution, our six of hearts, Shame the Stars by Guadalupe Garcia McCall, is a retelling of Romeo and Juliet, combining star-crossed love with drama, suspense and contemporary relevance. Thom Barthelmess, youth services manager, describes how the “two teens’ desperate love for one another is thwarted by their families, once close but now embroiled in the deepening conflict along the border between the United States and Mexico.” Suffused by themes of wealth, honor, romance and violence, Thom says this is a “sweeping, intimate and illuminating” read. In the three of spades selection, Eleanor Oliphant may have convinced herself that she’s fine, but for this quirky loner, true happiness comes with growth when she opens herself to a world of possibility and connection. 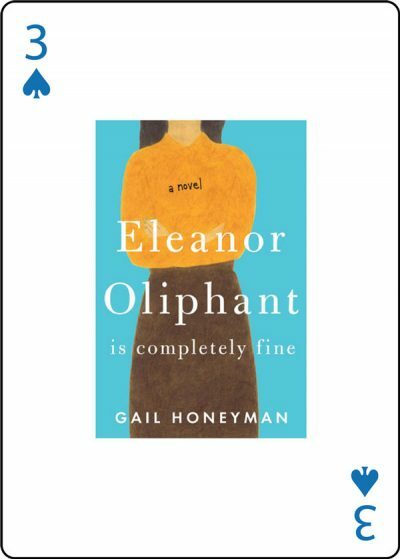 Eleanor Oliphant is Completely Fine by Gail Honeyman is a funny, charming story of growth expected to be made into a movie by Reese Witherspoon, so read it now.